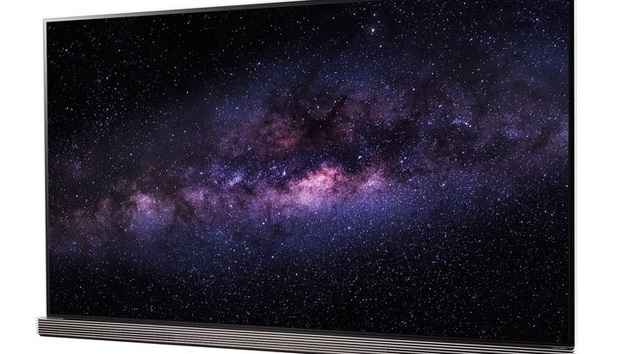 Were you so impressed by LG’s OLED TV Super Bowl ad that you‘ve decided to go out and buy one right now? If so, you’d better have $8000 handy. That’s the suggested price for the 65-inch LG OLED65G6P, the first television from LG’s “Signature” line of products. There’s also a 77-inch version on the way, though LG hasn’t yet announced a price for that one. USA Today reports that retailers will start filling pre-orders for the smaller set within 60 days. In terms of picture quality, OLED allows for deeper blacks and much greater contrast than conventional LED-backlit LCD sets, because it doesn’t require a backlight to illuminate each pixel. That lack of backlighting also allows for a slimmer panel; the OLED65G6P’s screen is mounted directly on a sheet of glass, and it’s just 0.33 inches thick at its thinnest. You might also want to read OLED vs. LED: There’s just no comparison. Beyond the 4K OLED display, the OLED65G6P includes a speaker system designed by Harmon/Kardon powered by a 60-watt amplifier. It ships with WebOS 3.0 smart-TV software and includes a voice-control remote. The TV also supports HDR (with both HDR-10 and Dolby Vision), and bears the new Ultra HD Premium certification, a set of performance metrics designed to separate exceptional TVs from merely good ones. Still balking at the cost? LG also announced a $7000 price tag for its OLED65E6P TV, which is similar to the OLED65G6P, but has a less powerful speaker system, a different image-mastering engine, and a slightly different design. You can also pick up last year’s 65-inch OLED for a cool $5000. Why this matters: Pricey as these TVs are, it’s something of a miracle that they even exist. OLED is notoriously difficult to produce at scale—especially in larger sizes—and with the exception of Panasonic, most major TV brands have walked away from the technology entirely. (Most are now turning to quantum dots, which greatly improve the color spectrum of LCD TVs but still don’t achieve the deep blacks of OLED). The difference in picture quality won't be worthwhile for vast majority of people, but just the fact that you can get a state-of-the-art OLED TV for less than $10,000 is impressive considering where the technology was just a few years ago.